The new service offering taps Walmart’s personal shoppers to select groceries for orders that are fulfilled through Postmates. Ford says that it’ll work with the retailer to “understand its operations,” identify which goods can be “feasibly transport[ed],” and pinpoint any issues that need to be addressed. Orders from a supermarket will tend to be larger and more varied than orders from a restaurant or dry cleaner. We’ll be exploring different vehicle configurations that we could make to meet people’s needs." Driverless grocery delivery is a hot new trend. 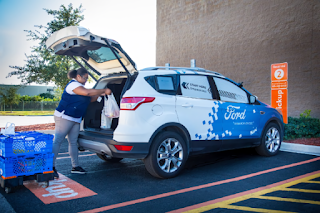 Nuro teamed up with grocery giant Kroger for self-driving grocery deliveries in the U.S. this summer, and shortly after, startup Robomart announced plans to test its driverless grocery store on wheels. In September, Udelv partnered with Farmstead grocery chains in Oklahoma City to transport perishables to customers’ doorsteps. The new service offering taps Walmart’s personal shoppers to select groceries for orders that are fulfilled through Postmates. Ford says that it’ll work with the retailer to “understand its operations,” identify which goods can be “feasibly transport[ed],” and pinpoint any issues that need to be addressed. 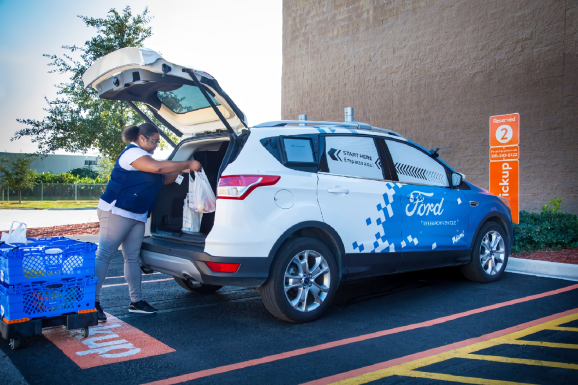 Ford’s self-driving trial with Walmart comes months after it launched a delivery program — albeit a non-autonomous one — with Postmates in Miami and Miami Beach, Florida. That program allows users to place orders from 70 businesses, including local favorites like Coyo Taco, which are delivered via Ford Transit Connect cars with multiple lockers, speakers that provide audible instructions, and a touchscreen, and that can perform multiple deliveries in a single route. That pilot expanded on a partnership with Dominos Pizza in Ann Arbor, Michigan and Miami, Florida, which kicked off in August 2017. The shuttles in that program feature a slightly different design and are equipped with GPS that customers can use to track their delivery. Ford executives have previously said they expect the company to launch a self-driving shuttle fleet in 2021, and the automotive giant has made progress toward that end. In early October, it proposed a standard language for automated vehicle system intent — a light bar mounted to the top of a Ford Transit Connect van. Moreover, in July, it committed close to $4 billion to its newly formed Ford Autonomous Vehicles unit. But the company has its work cut out for it. The increasingly competitive autonomous delivery market includes heavy hitters like Starship Technologies, which recently announced a $25 million funding round, and the aforementioned Nuro, which counts ex-Waymo employees among its executive ranks. San Francisco-based Dispatch is developing a short-range autonomous delivery robot designed to run on sidewalks, and AutoX is delivering goods from California-based companies like GrubMarket and DeMartini Orchard to customers in geofenced areas of San Jose. They’re all gunning for a slice of the autonomous robot market, which is expected to be worth $12 billion by 2024.